In Egypt, recycling of vegetable and crop residues is improving of environmental and efficiency of nitrogen use. In this study, artichoke (Cynara cardunculus L.) plants have been grown in field for nine months at three rates of nitrogen fertilization: 0 (N0), 250 (N250), 500 (N500) kg ha-1. The aims of this study are to assess effect of nitrogen fertilization of previous treatments on the chemical composition and mineralization of the artichoke. The results showed that the artichoke residues of the treatment N500 contained higher amounts of lignin, cellulose, hemicellulose and soluble C at 100Â°C and a lower soluble fraction Van Soest than N0 and N250 treatments. Artichoke residues contained 129.3, 89.2 and 57.4 kg N ha-1 for N500, N250 and N0, respectively. Carbon of artichoke residues was mineralized above 60% at 50 days in the incubation experiment, and then slowly CO2 release. Net N immobilization was observed during the first days of incubation in N0 and N250 treatments. While, the N500 treatment was mineralized immediately. The study demonstrated that the net N mineralization ranged from 38.26 mg N kg-1 dry soil for the control soil without residues to 56.30 mg N kg-1 dry soil for the soil treated with artichoke residues N500. These results could lead to greater efficiency of N use in rotations through return of vegetable residues, and alternative methods to improve the efficiency of vegetable residues disposal. Keywords: Artichoke residues, Incubation, Mineralization, Fertilization, Disposal, Rotations. Vegetable and crop residues become a very serious problem in Egypt lately that is because of the huge production of residues about 24 million ton year-1 (El-Shemy and Aly, 1997). The farmers start to burn vegetable and crop residues causing the black cloud and severe pollution in Egyptian atmosphere. High fertilizer inputs and the low crop recoveries of fertilizer nutrients (usually <10% in the case of N) lead to marked deterioration in soil and groundwater quality and the systems are clearly unsustainable (Zhu et al., 2005). Vegetable production is often characterized by an excessive use of N fertilization e.g. potato, artichoke and cauliflower, resulting in large mineral N residues in the soil and large amounts of crop residues rich in nitrogen at the harvest which stimulates the soil microbial metabolism and soil enzymes (De Neve and Hofman, 2002; Rahn et al., 1992).Their biological decomposition depends on the degradation rate of a wide range of C compounds present in the sample (carbohydrates, amino acids, fatty acids, lignin, etc. ), as well as on their nutrient content. Then the amount of CO2-C released from organic wastes in soil has been shown to depend on the material used and on their biochemical composition (Ajwa and Tabatabai, 1994). Mineralization processes are significant, particularly in soils affected by the long term cultivation and different cropping practices (Qualls and Richardson, 2000). Soil management and cropping practices are known to modify factors that affect most biological processes in the soil. soil tillage and crop residue management affected microbial population, activity, decrease or increase C and N dynamics and biomass (Islam and Weil, 2000). During mineralization of these crop residues, additional mineral N is released into the soil, resulting in large nitrate residues in the soil during the autumn and winter and serious problems with respect to nitrate leaching. Cauliflower residues as example contained from 80 to120 kg N ha-1 (Wehrmann and Scharpf 1989; Everaarts et al. 1996). Several studies have reported increased soil mineral N content following harvesting of plantation vegetables (Rahn et al, 1992; De Neve and Hofman, 1998). Artichoke (Cynara cardunculus L.) is a perennial rosette plant grown throughout the world for its large, fleshy heads. Most of its cultivation area is in the Mediterranean countries (Azza et al., 2010). Mineralization of artichoke residues (which over 65%) was not be studied until now. So, the aims of this study were to assess effect of nitrogen fertilization on the biochemical characteristics of the artichoke and nitrogen and carbon mineralization from artichoke residues. 2.1. Soil used and Artichoke experiments The composite soil used (0-20 cm) for the incubation experiments was a clay loam. Its main characteristics were 40.67 % silt, 10.69 % sand, 48.39% clay, 1.12 % organic matter, 9.74 % CaCO3, 0.49 g total N kg-1, 0.54 g total P kg-1 on a dry weight basis, 7.95 pH and EC of 3.85 dS-1 (soil saturated extract). These soil characteristics were determined according to Page (1982). The soil was taken after harvest artichoke to use in the incubation experiments for 180 days after leaving in field for one year without cultivation and disposal of weeds. Artichoke plants were grown in field for nine months during 2010/2011 seasons in Sedi Ghazy, Baharia governorate, Egypt. Three N fertilization rates were applied to artichoke plants: (1) a without N fertilization (N0), (2) a with 250 N kg-1 fertilization (N250), (3) a with 500 N kg-1 fertilization (N500) kg ha-1 that used by farmers. Each one was designed as a randomized complete block with three replications. The experimental unit included 5 ridges 40 cm in width and 4.0 m length, occupying an area of 8.0 m2. Nitrogen was given as urea (46.5%N) in equal portions, after one and two moths from planting. The stems, leaves and residues of tuber taken from these plants (10 plants for each treatment) after harvest were separated carefully. The mixture of artichoke residues included stems, leaves and residues of tuber that it uses in the mineralization experiment for 180 days after drying at 45Â°C with added for each treatment at the rate of 2.0 g dry matter kg -1 dry soil. Ash content of the 10 g of compost sample was determined by heating a muffle oven at 550 oC for 8 h, and organic matter was calculated as the difference between ash and dry weight. Fifty percent of the organic matter was considered to be carbon (AFNOR 1991). Carbon mineralization was studied in a laboratory incubation experiment at constant temperature and moisture. The mixture of the previous three treatments was one incorporated with 600 g dry soil and placed into 1500-ml capacity jars and mixed with double distilled water using 2:1 of water-soil ratio. A test tube (6 cm length, 2.5 cm diameter) containing 10 ml of 0.5M NaOH was placed in each jar. The jars were sealed with rubber corks and incubated at 28Â±1 Â°C. The evolved CO2 trapped in NaOH and the excess alkali was titrated with 0.5 M HCl after precipitating the carbonate with 30% BaCl2 solution. The cumulative C mineralization was calculated as the difference between CO2 evolved from the soil containing residues and CO2 evolved from the soil without residues. 20 g fresh soil was taken at different days for each treatment and KCl (2 N) was added, shaking for 1 h and filtering. Inorganic nitrogen (NH4+ plus NO3-) in the extracts was analyzed using the steam-distillation method (Bremner and Mulvaney, 1982). A separated set of soils was also extracted at the beginning of incubation to determine initial levels of inorganic N. Nitrogen mineralization was determined by subtracting initial inorganic N values from those after 180 days of incubation (Keeney and Nelson, 1982). The dried residues were fractionated using a modification of the method proposed by Van Soest (1963). Soluble compounds (SOLVS) were separated from neutral detergent fiber (NDF) by extraction with hot water (100Â°C) for 30 min. followed by extraction with neutral detergent (100Â°C) for 60 min. The acid detergent fiber (ADF) and acid detergent lignin (ADL) fractions were then obtained as described in the original publications by Van Soest. 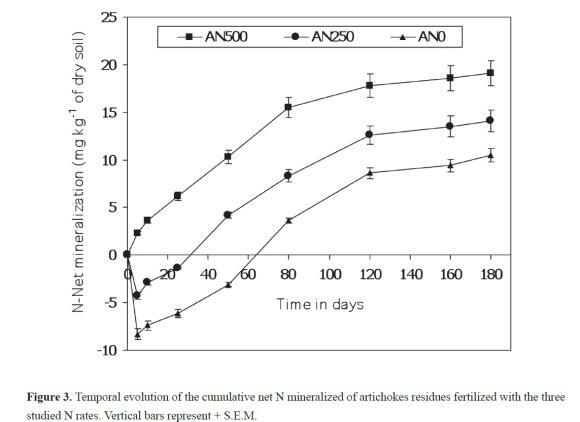 Table 1 presents effect of nitrogen fertilization on the chemical composition of the mixture artichoke residues. The artichoke residues of the treatment N500 contained higher amounts of lignin, cellulose, hemi-cellulose and soluble C at 100Â°C and a lower soluble fraction Van Soest than N0 and N250 treatments. Nitrogen concentration of the mixture artichoke residues in the soil treated with N500 was higher than the other treatments, resulting in a lower C: N ratio. The total dry matter (DM) yield of artichoke was increased with increasing N application. The amount of total dry matter of artichoke residues was 5.45, 4.43 and 4.05 t ha-1, for N500, N250 and N0 treatments, respectively, corresponded with 21.36 40.7, 35.2 and 36.2% of total dry matter. Total N uptake of artichoke plants increased with increasing N application (Figure 1). Artichoke residues contained 129.3, 89.2 and 57.4 kg N ha-1 for N500, N250 and N0, respectively. The amount of N in the residues was about 35Â±1.8% of total N uptake. In this study, the effect of N fertilization on the amount of cumulative carbon as CO2 released during specific time-intervals from each treatment is shown in (Figure 2). In the all treatments, the amount of C-CO2 initially released rapidly during the first 50 days, where more than 60% of C initially brought by the residues was lost in the form of C-CO2. After that, the amount of C-CO2 continued to increase less rapidly till 120 days, and increased again to 986, 904 and 810 mg C kg-1 of dry soil by the end of the incubation period for the N500, N250 and N0 treatments, respectively. Significant difference was observed between the three treatments at 180 days with the threshold (p > 0.05). As illustrated in Figure 3 the nitrogen was immobilized in the initial period to about 4.3 mg N kg-1 of dry soil in N250 and 8.3 mg N kg-1 of dry soil in N0 treatments. While, the N500 treatment was mineralized immediately. The N-net mineralization increased to around 17.8, 12.6 and 8.6 mg N kg-1 of dry soil after 120 days for the N500, N250 and N0 treatments, respectively. After about 120 this mineralization was essentially complete because the rate of release of N thereafter was very slow, this is complete agreement with the results of the mineralization of carbon (Figure 2). At day120, the statistical analyzes showed a significant difference between treatments (p < 0.05). At the end of the incubation period, the N- net mineralization of the artichoke residues was of 19.1, 14.1 and 10.5 mg N kg-1 of dry soil for the N500, N250 and N0 treatments, respectively. In this study, the net N mineralization ranged from 38.26 mg N kg-1 dry soil for the control soil without residues to 56.30 (38.26 soil +18.04 residues) mg N kg-1 dry soil for the soil treated with residues N500. Carbon of artichoke residues was mineralized about 60 % of total organic carbon after 50 days of incubation. This indicates that the artichoke residues were degraded quickly. Jenkinson (1977); Sauerbeck and Gonzalez (1977) explained that easily organic compounds was degradable in the early phase of decomposition by the micro-organisms and which consti- tute according to these results more than 55% of the dry matter of the products used. Ajwa and Tabatabai (1994) and Recous (2002) found that the carbon from sugar beet residues mineralizes more quickly in soils, than that from other crop residues, suggesting that the readily decomposable organic -C fraction in sugar beet residues higher than in other crop residues. The chemical composition of artichoke residues found here were the same pattern as in the sugar beet residues. The carbon mineralization process observed was best described by combined two steps, which suggests that the organic carbon content of the residues was made up of two fractions of different degree of biodegrada-bility: labile organic compounds which were rapidly mineralizable in soil, and compounds which were resistant to microbial attack and which broke down slowly during a second step (Bernal et al., 1998). C mineralization was high about 12% for a mixture cotton (leaves and stems) compared to stems only. These results indicated that carbon mineralization improved with mixed of different plant parts, especially in the components of the mixture that contained a little nitrogen, or molecules of the plant parts limiting the decomposition (Quemada and Cabrera1995). Net N immobilization was observed during the first days of incubation in N0 and N250 treatments. The C: N ratio of the returned organic matter is known to vary with sampling time, decomposition stage, and quality (Kumar and Goh, 2000), and can thus result in an increased or decreased effect on N mineralization. Since the ability of soil organisms to break down additional organic substrate does not normally change as a result of system diversity (Sanchez et al., 2001), the C:N status of the returned organic matter probably played an important role in increasing or decreasing the effect of previous N application on N mineralization. Most authors (e.g., Paul and Clark, 1989) have suggested that net N mineralization occurs when C/N ratios are > 25. Nevertheless, some authors (e.g., McKenney et al. 1995 and Jensen, 1994) found that the vegetable residues with a low C: N ratio can cause net immobilization of the mineral N soil which it was in agreement with these results. In treatment N500, the micro-organisms were used the first mineral nitrogen of the residues directly that it was available, before using nitrogen resulting from the mineralization of the residues which it was high, contained NO3 and low C: N ratio in their parts (Table 1). On the other hand, the immobilization in the N0 and N250 treatments that it was probably the interaction between leaves and stems which it was higher C: N ratio and lower NO3 compared to N500 treatment (Table 1). 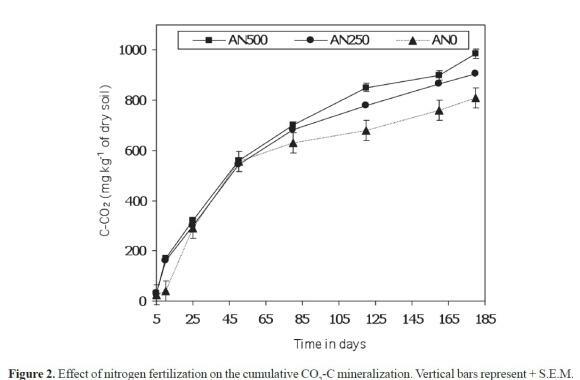 Nitrogen mineralized during laboratory incubation also increased with increasing N application. Rasmussen et al., (1998) showed a similar flat response of nitrogen mineralized increased with increasing N application. The high N release from the N500 and N250 compared to N0 indicated that it was due to residual effect of fertilization on the mineralization. Li et al. (2010) found that the cumulative mineralization of organic N and C increased with paddy soil fertility level (high> middle> low). Carpenter et al. (2000) who reported that more N was mineralized from plots receiving high fertilizer N than from plots receiving low fertilizer N, and that there was more N mineralized from plots receiving no fertilizer N.
The net N mineralization ranged from 38.26 mg N kg-1 dry soil for the control soil without residues to 56.30 (38.26 soil +18.04 residues) mg N kg-1 dry soil for the soil treated with residues N500. The net N mineralization in this study was different the net N mineralization of cauliflower residues in the field reported by (De Neve and Hofman, 1998). This may be attributed to the different of plant types, initial total N content in the soil, experiment application and chemical composition of the type residues. Nutrient release from artichoke residues is important to N management and the success of conservation and sustainable farming systems. Nitrogen immobilized in the initial period with low C: N ratio was observed in this study. C and N mineralization from artichoke residues was dependent on the initial total N content in the plant and chemical composition of the artichoke residues. Nitrogen and carbon mineralized during laboratory incubation increased with increasing N application. Previous N fertilization for artichoke plants was effect on the chemical composition and C and N mineralization of the artichoke residues, these studies could lead to greater efficiency of N use in crop management rotation systems. I thank the Laboratory of Soil and Water Sciences, Agriculture faculty, Tanta University, Egypt for assistance during this work.